It is almost impossible to imagine our lives without newest gadgets. What are the other ways to inform somebody that you are late or have some news? What is an average number of your visits to Instagram to check the updates during a day? Will you find a certain street or address not using Google Maps? Nowadays, people are totally absorbed with the handy technological devices coming out on the market. That is why, smartphone apps are flourishing. However, many scientists tell that apart from benefits, smartphones may bring harm making people anxious, introverted and oppressed. Young adults are considered to be the most vulnerable age category to undergo the dreadful changes. While these claims might seem to be too exaggerated and you have not noticed any signs of depression, you could definitely admit the fact that you devote an enormous deal of time to your virtual life. What is more, Pew Research Center held an opinion poll and almost half of the surveyed told that devices are an integral part of their existence. But still there are some approaches to loosen the tights of subjection not entirely excluding it from the use. 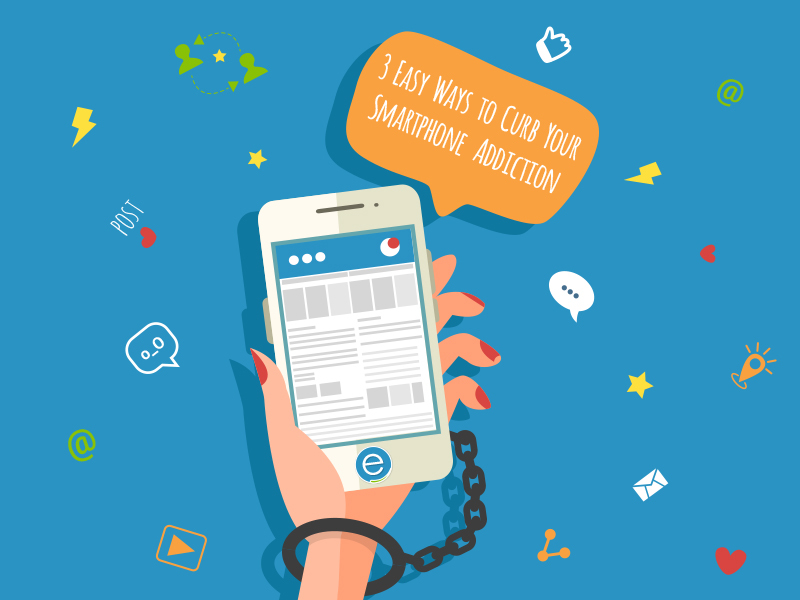 Here is the list of ideas to help you to pull your eyes away from the screen of your smartphone and of how to stop Internet addiction. Notifications make you react and take phone into your hands. Sometimes there is something really important coming out, for example, somebody wants to reach you. A research undertaken in 2015 by Gallup shows the data that approximately 50% of smartphone users check the device on an hourly basis. After a period of time it grows into a habit or rather an uncontrollable move that is affected by our brain. Apparently, a constant need to verify the upcoming messages turns to dopamine circuitry, the section that makes us want more. If you want to be done with this, then you should change the notification settings. They truly have a quite destructive effect and divert attention giving you no chances to concentrate. Even if there is a low risk that you will miss some urgent information by responding a little bit later, the advantage you get is worth it, as you will throw out those irritating endless throbbing. Messages and new posts in social networks are not the only things that push you to stretch out for your gadget. One more straining detail is the percentage of battery remaining. This number actually depends on how much you have already been making use of it at a certain day. It cannot change mysteriously itself. Additionally, it does not make any difference whether you know it is 78 or 69. Therefore, take it under your control and factor in an average time you could spend in the Internet taking into account your further schedule for this very day. So, turn off the setting that gives you a notice on the battery levels. Sure, you’ll have the sense of broad brush number and it will not sidetrack you. Tristan Harris, a specialist in cyber addiction, gives a piece of advice to change the brightness of the smartphone screen, so to say to make it a little bit colorless and pale. Fix upon the grayscale tones. Surprisingly, it changes the way you perceive it. The smartphone looks monotonous and it does not pull you on as before. All the apps and functions you used earlier still remain, but hanging over the popular social network will not seem to be that attractive. The option is much easier established on the Iphone, but you could also take a guess and find it in your Android settings. How long does it take to break an addiction? We don’t know, but we already know the internet addiction causes. Once you know the problem, you are on your halfway to find an answer to it. You know cyber addiction meaning. You know how to break a phone addiction and how to break Internet addiction. The smartphone addiction solution that we propose to you is to get rid of tiresome vibrations, to stop checking the battery percentage and to switch on grayscale colors on your device.